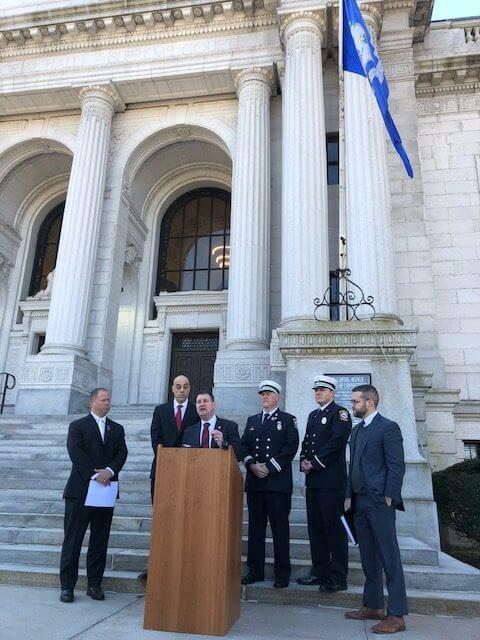 At a press conference on the steps of the Connecticut Supreme Court building, firefighter and president of the New Haven Firefighters Local 825, Frank Ricci, announced the New Haven Firefighters have filed suit against the state-wide firefighters union. Ricci called leadership of the Uniformed Professional Firefighters Association “scammers” who have taken the dues money of New Haven firefighters and “misappropriated” it for their own use. 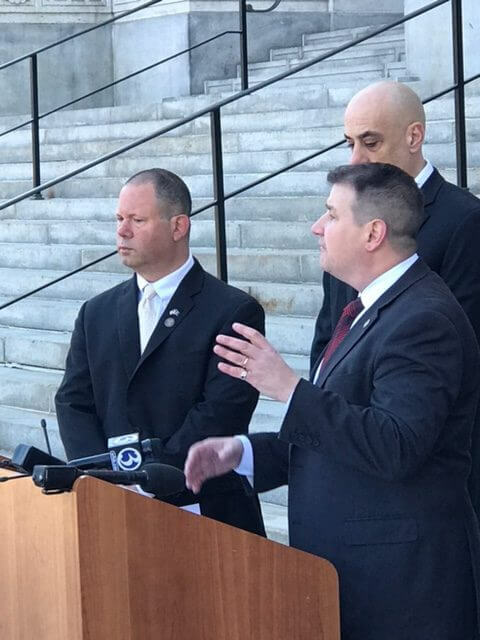 The New Haven Firefighters Local 825 is demanding $96,000 in dues to be returned by the UPFFA and for the court to reaffirm their disassociation from the state union. “As president of New Haven Firefighters and a battalion chief, I’m disheartened to say that the state union bureaucrats are trying to pick the pockets of New Haven firefighters,” Ricci said. The Local 825 executive board voted unanimously to leave the UPFFA in January of 2016 while remaining members of the International Association of Firefighters, but the UPFFA has been pushing back against that decision. In their court filing, the New Haven Firefighters contend that while they were paying “legislative only” dues to the UPFFA, the state union was using the money to pay for collective bargaining and other activities for other UPFFA members. Ricci claims that since their decision to leave the state-wide union, his members have faced increasing pressure by the UPFFA to reinstate their membership. The UPFFA continued to send the New Haven Firefighters Local 825 a bill for dues every month, even though they had voted to leave the union. According to the complaint, the UPFFA then hired a collection agency to collect back dues from the firefighters. “They hired a collection agency in response to harass our families, intimidate us and bully us into trying to pay into their coffers,” Ricci said at the press conference. The New Haven Firefighters Local 825 is being represented by the Fairness Center, a non-profit public interest law firm, which offers “free legal services to those hurt by public employee union officials,” and by Rep. Craig Fishbein, R-Wallingford, who is acting as local counsel for the case. President of the Fairness Center David Osborne, says this is the first case in which they’ve represented one union against another. Ricci said the UPFFA has “forced” them to file suit as a last resort. “We’ve tried to work with them through the International, through meetings for over two years. New Haven firefighters didn’t want this action. They forced this action,” Ricci said. Peter Cardozza, president of the UPFFA, did not immediately return request for comment.